To start the year on a good footing, I am redoing a number of my blogs. Several of them used to be hosted on Tumblr. Unfortunately Tumblr is losing its edge, so I am now migrating them in WordPress, hosted to my own server. The Weird Bit is the new format for my aggregator of weird and offbeat news. A bit of fun in this world of continuing bad news... The updates are tweeted via @TheWeirdBit. Oh, and I also migrated over about 20,000 blogposts from the old blog. Aid Resources aggregates the latest articles from a large number of sites with reference articles in the aid and humanitarian world. Updates via Twitter on @AidResources (used to be @ChangeThruInfo). I moved over 40,000 posts from its old blog home. 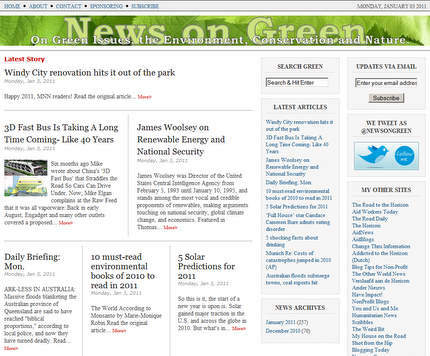 News On Green collects the latest blogs and articles on the environment, climate change and nature conservation. Tweeted via @NewsOnGreen. I migrated 86,000 articles from the past 28 months on this new blog. Each of the blogs have a faster aggregator, a better search mechanism, an improved RSS generator and an easy way for people to subscribe by Email for automated updates. I am still fine-tuning the layout. If the new blog-hosting works out OK, I will move over the remaining blogs one by one. Check out my full bloglist. This should be interesting. Happy New Year ! And hope lots of good stuff happens this year to many people. Life is short and no one should have to suffer.